Lets explore as much as possible. "कर्मणयेवाधिकारस्ते मा फलेषु कदाचन" - You have a right to perform your prescribed duty, but you are not entitled to the fruits of actions. "मा कर्मफलहेतुर्भूर्मा ते सङ्गोऽस्त्वकर्मणि" – Never consider yourself the cause of the results of your activities and never be attached to not doing your duty. Lets share with you about fascinating journey of my photography. Time freezes here for eternal view thats a photograph. Lets sit together ,exchange ideas for a great living. Suman Deb, Assistant Professor, Department of Computer Science and Engineering, NIT Agartala. His primary research interest span the areas of Human-Computer Interaction, Education Technologies. This is also blended with critical issues of augmented face to face interaction. Innovation in teaching - learning method is a incessant endeavor of his work. He is also the faculty-incharge of HCI and AI lab of NIT Agartala. His team has developed various low-cost innovation in access control, skeletal movement analysis, ROV etc.He is passionately involved in the design of computer mediated learning environments for transforming traditional classroom into interactive one. Besides academics, Suman is highly active in cycling, music and quilt design. Motivated and bright students are invited to work with him on topics of relevant interest. Outstanding students will have the opportunity to work with and co-advised by esteemed researcher. Additional Secretary (Publicity) NIT Agartala Alumni, IEI Tripura State Centre Joint Honorary Secretary(2015-2017). UK(2015), Ireland(2015), Bangladesh(2014,2017), Australia(2013), Singapore(2013). Awarded best oral presenter during Current Trends in Scientific research observed on Research Scholars Day 2018 at NIT Agartala. 1st February 2018. Guinness World Record accomplished as the program convener and faculty coordinator. Awarded special appreciation certificate by NIT Agartala authority. Paper Selected among Top three during (Indian International Science Festival)IISF - 2016 at National physical Laboratory , New Delhi. Best Paper Awardee during Information Systems Design and Intelligent Applications (INDIA 2016), Springer conference, Bisakhapattanam. Best Paper Awardee during ERCICA-2014, Elsevier , Bangalore. Awarded First prize for paper presentation in the sector on Engineering for Development during Tripura Science Congress-2011. Awarded for Best paper presentaton at Internatinal Conference on Advances in Communication, Network and Computing-CNC 2010, October 04-05 2010 Calicut, Kerala, India. Guided science model won FIRST prize at State level Science Fair 2009. Awarded FIRST position in event EUREKA at KSHITIJ 2005 , IIT Kharagpur. GRADE A certified in the Intelligence & Science Talent Test, organized by NATIONAL SCIENCE SOCIETY. FDP Coordinator, “5 Days Faculty Development Program on High Performance Computing” Oct 29 - Nov 02, 2018; Monday – Friday. Program Coordinator “5 DAYS NATIONAL WORKSHOP ON HUMAN COMPUTER INTERACTION” during April 23-27, 2018 NIT Agartala under the aegis of TEQIP-III. Program Coordinator “5 DAYS NATIONAL WORKSHOP ON CYBER SECURITY” during June 16-20, 2018 NIT Agartala under the aegis of TEQIP-III. Program Co-Coordinator “2 Days National Workshop on Android Apps Development” 10th – 11th March, 2016 NIT Agartala. Program Coordinator “2 DAYS NATIONAL CONFERENCE ON ASSISTIVE TECHNOLOGY FOR PERSONS WITH DISABILITIES” Convened on 20th-21st February 2016 at NIT Agartala in association with NIEPMD. Program Coordinator “2 DAYS NATIONAL WORKSHOP ON HUMAN COMPUTER INTERACTION” during February 15-16, 2016 NIT Agartala. Technical committee member- One day workshop on “Intel HPC code modernization (Parallelization)” 6th August 2015 Jointly organized by CSE Department NIT Agartala and Wipro Infotech High Performance Computing Division. Organising committee member –One day Workshop on IPV6 at NIT Agartala on 19th May 2015 sponsored by Department of Telecommunication, Ministry of CIT Govt of India. Program Coordinator “1 day workshop on Study Connect” during 15th July 2015 NIT Agartala with more than 500 participants. 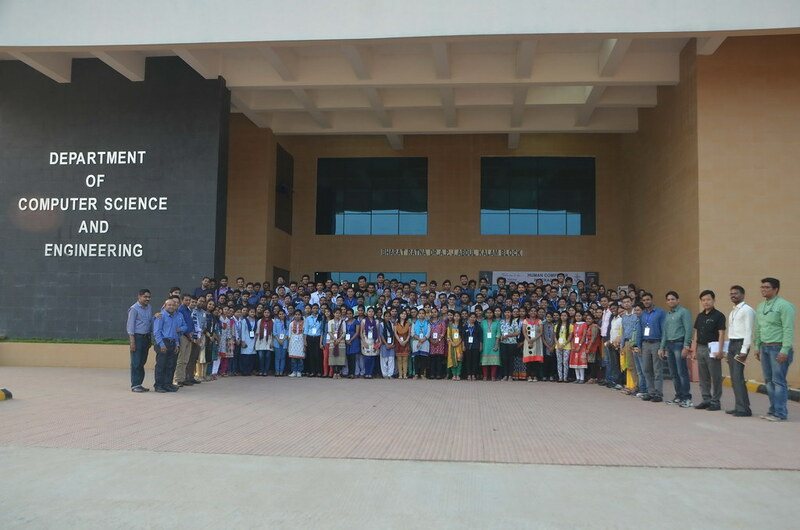 Program Coordinator “2 DAYS NATIONAL WORKSHOP ON HUMAN COMPUTER INTERACTION” during February 13-14, 2015 NIT Agartala. Organising committee member – two days National Workshop on “CLOUD COMPUTING” during October 20-21, 2014. Technical committee member for two days National Workshop on “MATLAB and its Application in Digital Image Processing and Pattern Recognition” during 29-30 November 2013.Sponsored by Technical Education Quality Improvement Programme (TEQIP) Phase II, Govt. of India. Two week ISTE Workshop on “Analog Electronics” during 04th June- 14th June 2013 held under National Mission on Education through ICT(MHRD). Two week ISTE Workshop on “DATABASE MANAGEMENT SYSTEMS” during 21st – 31st May, 2013 held under National Mission on Education through ICT(MHRD). 4 days Aakash Android Application Programming for ENGINEERING STUDENTS 23-24 Feb and 2-3 March 2013 under National Mission on Education through ICT(MHRD). TWO-DAY ISTE WORKSHOP on Research Methods in Educational Technology Under the National Mission on Education through ICT (MHRD, Govt. of India) 2nd & 9th February 2013. Two week ISTE Workshop on “Introduction to Research Methodologies” during 25th June- 04th July 2012 held under National Mission on Education through ICT(MHRD). Two week ISTE Workshop on “Solar Photovoltaic : Fundamentals, Technologies and Applications” during 12th -22nd December 2011 held under National Mission on Education through ICT(MHRD). AICTE sponsored staff development programme on "Artificial Intelligence for Industrial Application" , Novembe 13-22 ' 2009. Apart from regular curriculam, highly motivated students of any semester are allowed to work in the lab to accomplish a relevent task. It is better described as my skillset in using tools to accomplish various task. "While User Experience is a conglomeration of tasks focused on optimization of a product for effective and enjoyable use; User Interface Design is its compliment, the look and feel, the presentation and interactivity of a product." Working in this field makes it enjoyable for its natural challenges to make machine interaction more NATURAL. Naturally human always enthralled by the taste of food, sound of a music, colour of dress and feel of touch. These sensory factors effecting human pleasure feeling and keep rise to the interest to attention. So as they effect the teaching learning process in any traditional classroom. My primary study focus is to enhance teaching-learning pleasure level, learning outcome and increase performance score by blending Augmented Technology Aided Teaching and Rapid Evaluation System (ATAT-RES). Large population find classroom learning is not interesting and eventually formal teaching-learning process stands out to be a fear factor or tedium matter. This situation is acute in several developing densely populated countries, where one to one attention and motivation is difficult. In turn this less discussed pleasing factor in teaching learning promotes unproductive "jugar solution practitioner" rather formal problem solver. This is apparently noticeable from large gap in school input and professional level out put with appropriate competency and domain specific employability. I consider HCPI(Human Computer Pleasurable Interaction) outperforms the traditional HCI in significant manner in present time teaching learning classroom scenario. Here at NIT Agartala AI and HCI lab we are experimenting, prototyping and evaluatioing systems and design factors on the low cost augmentation in classroom interaction with formative nature for a continuous engaged learning environment. My philosophy of Motivation - Frugal and flexible approach to innovation for local problem – local solution . My profession gives an innate satisfaction and an immense sense of responsibility. Through this centuries old noble profession and ‘Guru-Shishya’ relation I get the chance to have an insight in to the personality of several individual. I endeavor to attain my perfection through my duties. Major topics - IOT, Remote Machine Interaction, Android Programming. High quality Audio and Video Capturing for research presentation. Please find notice for upcoming lecture program , workshop etc for student chapter members. NIT Agartala students from any department can contact for photography related study and activity. It is a serious application of engineering. To have glimpse of few prototype visit Ai Lab Room 216. Disclaimer: These share content are third party resources. Most of them are Open Source. As these are knowledge enhancer, I am sharing them particularly for my students to enhance knowledge only. I do bear no responsibility of understanding nor of usage of the information. I am no way concerned or connected with the views and expression included in the contents in any form. Happy learning. Arduino : http://www.arduino.cc/ : Arduino is an open-source electronics prototyping platform based on flexible, easy-to-use hardware and software. It's intended for artists, designers, hobbyists, and anyone interested in creating interactive objects or environments. Fritzing : http://fritzing.org/ : Fritzing is an open-source initiative to support designers, artists, researchers and hobbyists to work creatively with interactive electronics. We are creating a software and website in the spirit of Processing and Arduino, developing a tool that allows users to document their prototypes, share them with others, teach electronics in a classroom, and to create a pcb layout for professional manufacturing. Processing : http://processing.org/ : Processing is an open source programming language and environment for people who want to create images, animations, and interactions. Initially developed to serve as a software sketchbook and to teach fundamentals of computer programming within a visual context, Processing also has evolved into a tool for generating finished professional work. Today, there are tens of thousands of students, artists, designers, researchers, and hobbyists who use Processing for learning, prototyping, and production. OpenCV : http://opencv.willowgarage.com/wiki/ : OpenCV is released under a BSD license, it is free for both academic and commercial use. It has C++, C, Python and soon Java interfaces running on Windows, Linux, Android and Mac. The library has >2500 optimized algorithms (see figure below). It is used around the world, has >2.5M downloads and >40K people in the user group. Uses range from interactive art, to mine inspection, stitching maps on the web on through advanced robotics. Free eBooks by Project Gutenberg : http://www.gutenberg.org/wiki/Main_Page : Project Gutenberg offers over 40,000 free ebooks: choose among free epub books, free kindle books, download them or read them online. We carry high quality ebooks: All our ebooks were previously published by bona fide publishers. We digitized and diligently proofread them with the help of thousands of volunteers. No fee or registration is required. Interactin with you is important. Please do leave a message[Click here]. Thanks for visiting the site. Last updated on: 14-11-2018 N.B: This site is under construction.